We had a very pleasant surprise when going through our photographs of ovipositing tandems of the Red-Veined Darter (Sympetrum fonscolombii). Like all European Sympetrum species, Red-Veined Darters lay their eggs in tandem; after copulation the male takes the female in tow and together they fly low over the water. By changing her body angle the female signals to the male she's ready to lay another batch of eggs, and so the tandem swoop down with the female's body now in a vertical position, she dips the end of her abdomen into the water and releases her eggs. We had noticed shoals of small fish swimming at the surface of the water and apparently feeding on those freshly-released eggs. What we hadn't seen - in all honesty - was that the fish in the photograph had bigger things in mind. Luckily for the tandem, he missed (or rather, they parried his attack by flying up swiftly), but presumably not every tandem manages to do so. 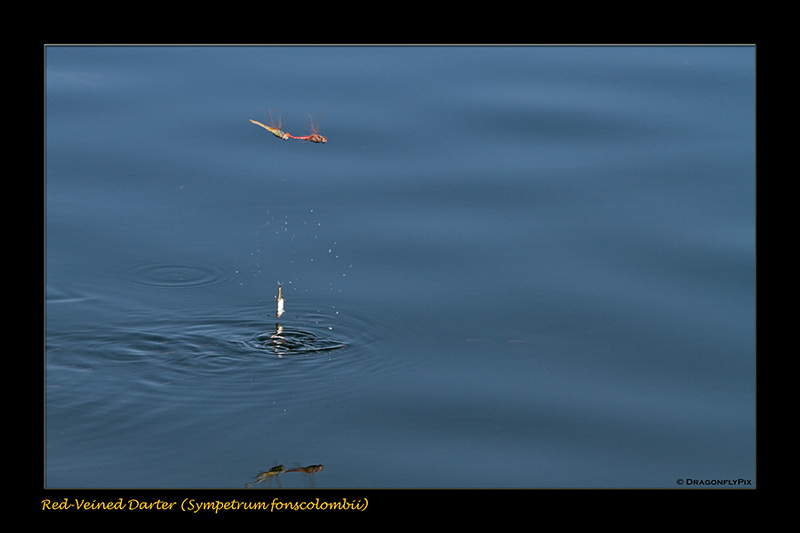 Jumping fish are a common sight (and sound) at dragonfly-rich waters and some of their attacks must be successful; why else would they bother?